Boulder, Colorado. July 8, 2014 – The Golden Spike Company and Honeybee Robotics have completed a preliminary design study for unmanned rovers capable of enhancing the next human missions to the moon. In partnership with technical staff at Golden Spike, Honeybee engineers conducted trade studies of both flight-proven and promising technologies to design configurable robotic rovers that can collect and store several kilograms of scientific samples from the Moon’s surface in advance of, or in conjunction with, Golden Spike’s human expeditions. “We’re excited to add the possibility of extending human lunar expedition productivity with precursor sample cache rovers that can make longer traverses than a human expedition can. Honeybee’s rover design study for us forcefully demonstrates the promise that such rovers can be accomplished with modest resources,” said Dr. S. Alan Stern, Golden Spike’s President and CEO. 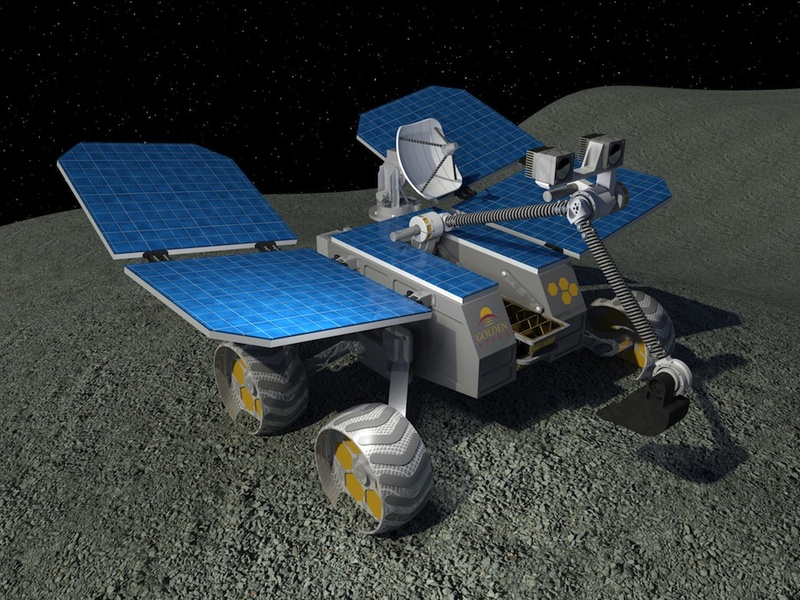 In 2013, an international scientific workshop led by Golden Spike proposed new concepts for lunar missions, including robotic-human expeditions. The proposal envisions sending robotic systems to the Moon to collect samples ahead of a crewed Golden Spike expedition to retrieve the robot’s cache. The concept allows the scientific return of a mission to be more extensive, since it would include samples collected by the rover many miles (kilometers) away from a landing site. Honeybee has a heritage in planetary sampling and geotechnical analysis, having delivered systems for the last three of NASA’s Mars landers, including the Rock Abrasion Tool for the Mars Exploration Rovers; the “Phoenix Scoop” for the Phoenix Mars Lander; and the Dust Removal Tool and Sample Manipulation System for the Mars Science Laboratory. The company’s facilities are equipped with NASA-certified clean rooms and unique space environment simulation chambers. Honeybee Robotics met Golden Spike’s Science Advisory Board requirements with a design for a teleoperated rover that can traverse 10-100 km and collect both regolith and rock samples from multiple sites, storing them in individual bins for later analysis. The rover weighs just 77 kg as designed, with a stereo camera for enhanced imaging and navigation. The rover is designed with additional capacity to accommodate various payloads, such as Honeybee’s NanoDrill rock coring drill and other science instrumentation. The study with Honeybee is one of a number that Golden Spike is undertaking with industry partners in preparation for future flight system procurements. Market studies conducted for the company show the possibility of 15-25 or more expeditions in the decade following a first landing.